Thiruvananthapuram being the royal capital of erstwhile Travancore Kingdom is home to numerous palaces and royal mansions. Most of them are located within the Fort area close to Sri Padmanabha Swami Temple. Among all the palaces in Kerala, Kuthira Malika stands out because of its architectural style and also because it hosts one of the most renowned musical events in India. Built by the renowned Musician-King Swathi Thirunal Rama Varma of Travancore in 1840s, Kuthira Malika is a never miss location in Thiruvananthapuram (Trivandrum) for all those who are interested in Travancore kingdom’s history and culture. The palace is located close to Sri Padmanabha Swami Temple. 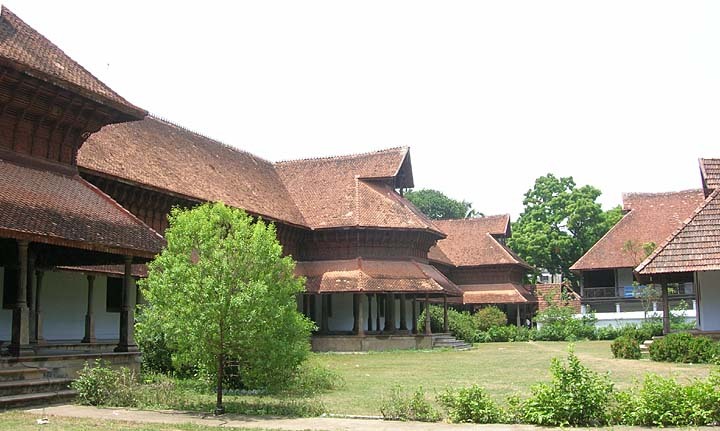 Originally named Puthan Mailika (New Mansion), it got nick named as Kuthira Malika (Horse Mansion) thanks to the 122 wooden horses supporting the roof of the palace. Built in typical Travancore style architecture with teak, marble, granite and rosewood, the palace is a visual treat for visitors and a knowledge base for those interested in architecture. The palace contains 80 rooms. 20 rooms of the palace now houses a palace museum where some of the royal assets are displayed, including the famous Ivory Throne. The palace also houses the illusion portrait of last Maharaja of Travancore Sree Chithira Thirunal Balarama Varma by famous Russian painter Svetoslav Nikolaevich Roerich. The face of the Maharaja appear facing the onlooker from every corner in the room. For those interested in music, there is another reason to visit Kuthira Malika. The courtyard of Kuthira Malika is the venue for famous music fest Swathi Sangeethotsavom conducted from January 6 to 12 of every year. The event attracts leading stalwarts in Carnatic and Hindustani music. Some of the performers in previous years include, Bismillah Khan, Balamurali Krishna and D K Pattammal. Trivandrum is place where culture and history blends perfectly with modernity. And Kuthira Malika is one place in the city where you can experience that blending. Visit https://www.keralatourism.org/destination/kuthiramalika-palace-east-fort/58 for contact details.